In the last post, Drain Pipe and No Memory, I was on my way to Metro Supermarket with plans only to buy some deodorant, and that’s usually I would get. I suppose I’m the typical guy shopper. I go in to get something, I get it, check out and leave. Mostly I do not carouse inside the store, especially when I have not eaten yet. Today as I was heading to the check out with my P85 Axe deodorant, I spied a stack on little notebooks. I use these little notebooks for taking my notes for this blog and a few other things. 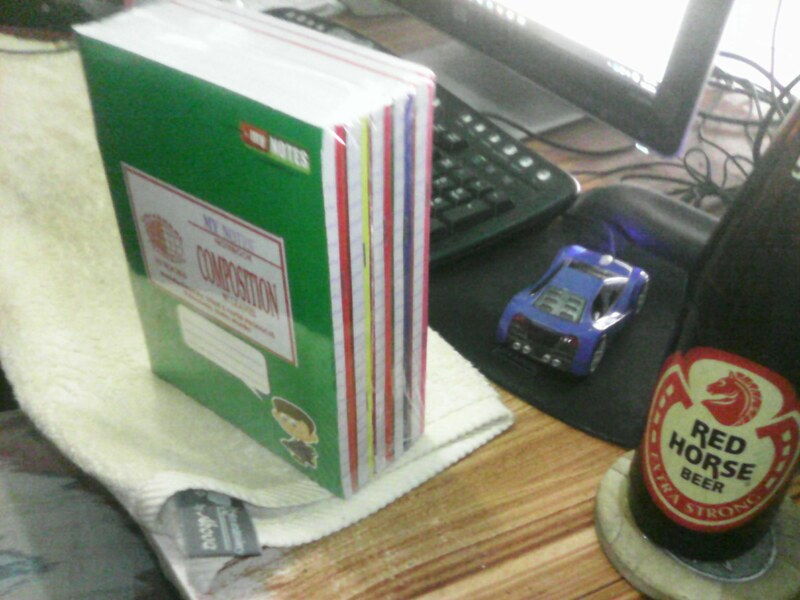 It was a stack of 10 notebooks for P99. That’s about P10 per notebook and I believe the regular price is P13 each, maybe more, I don’t remember for sure. Anyway, I grabbed a stack of those also. I could have gotten a stack of 9 with 2 pens, but I opted not to because I know they were cheap pens and probably did even work, or wouldn’t for long. Maybe my next trip if they are still on sale, I’ll get one of those. I was only the 3rd person in the express lane so those lines I don’t mind so much to wait in, especially when they had 3 cashiers working the express lanes. One line for all 3 cashiers. When I went outside to take the tricycle they wanted to know if I want “Special”. I always so no. Special means that they will not wait for other passengers, but they expect you to pay for the empty seats. Depending on the tricycle on how much that will cost you. Of course if you have stops to do along the way, that costs more. No set prices, it’s up to you, but you don’t want to get a reputation of being a cheap skate because word travels fast within the tricycle community. I just tell them no and wait for others to get in the tricycle. He just happened to get 2 people that were heading to the new market close to my house. He also picked up one other person heading to the market. Well not the market, but the bus depot in the market parking lot. Close enough. So I ended up paying my normal fee of P20. Ninoy, our handy handyman, stopped by to replace the broken drain under the kitchen sink (which I also mentioned in the last post). He was actually on another job, but asked them for a couple of hours off to come by and take care of our problem. The total cost for the parts and labor was only P500 ($11). I guess the P2000 I got while downtown was enough. I hope she buys some meat and vegetables with the rest of the money. It’s all we have until payday in 6 more days. Next post I will share something that surprised me about my phone and there will be more on Ninoy. Seems he is more than a handyman. I’m not sure what kind of vehicle you were taking. Was it a motorized trike or a center car? You should be able to get an motor trike anywhere in the downtown area for P10 (normal fare) or P20 to Bagacay. If it is up to you as you say, you would wind up paying more than you need to. Who cares about reputation… we should not be expected to pay more than the going rate. I save my pesos – that’s my allowance! It was just a motorized trike, one waiting outside of the supermarket. When they say special to me, I automatically think of the jeepneys when they ask. You can travel alone in them also, if you pay for all the seats. I don’t take tricycles in the downtown area, I always walk. I only use them when going home, at least most of the time. Sometimes I also walk home. Glad you got your drain fixed. I find it unusual that the trikes there ask about special I know that is normal it the resort areas with a lot of foreigners but would not expect it in the province. I’ve never been ask that in sorsogon…. It was actually my first time asked here too. Maybe since it was outside of the supermarket they are expecting a lot of customers and want to fill up as much as possible. Maybe next time I’ll just walk down the road and get another trike and won’t have to wait. Although I only waited like 5 minutes. I’ve had to wait longer for a jeepney here to fill and several times for buses in Manila to fill up. And in sorsogon if there full inside they climb up and ride on the roof. I don’t mind waiting, but not for too long. I think about 30 minutes maximum and I’d either find another ride or volunteer to pay for the empty seats. I just don’t like to wait. Of course if the jeepney is full of beautiful women to look at, then I can wait a little longer. Unless Lita is with you!